The kite surfers on Tarifa's beaches are a very visual reminder that the Straits of Gibraltar are in fact a magnificent natural crossroads, where conflicting winds and sea currents dissect western Europe's most important migratory bridge to Africa. The narrow seaway gradually replenishes the Mediterranean with fresh oceanic water while at the same time funnelling the easterly Levante wind from Africa or the westerly Poniente from the Atlantic. At speeds of between 40 and 60 miles an hour, these winds not only attract thousands of pleasure-seeking tourists, they also define the coastal habitat of the region's many seabirds, shorebirds and waders. To see for ourselves, our small bird watching group, led by Manuel Morales of Birding Tarifa, headed just up from Tarifa's beaches to Los Lances Nature Reserve. Among its sand dunes, marshlands, beach grass and sea lilies, we spotted waders such as the grey heron and the bar-tailed godwit, while starlings and swallows swirled overhead trying to catch flying ants. It's sometimes tempting to ignore the importance of these smaller birds but as our guide Manuel pointed out, a swallow can eat twice its weight in mosquitoes! Ecologically, the Mediterranean is reliant on the Straits of Gibraltar as its only source of fresh seawater; even though it takes around a hundred years to renew itself. And this slow exchange of water between the Atlantic Ocean and the Mediterranean also stirs up a rare undersea biodiversity with algae and plankton feeding a variety of fish, squids and crustaceans, which in turn sustain various species of cetaceans. So after lunch, we headed out on a boat trip to take a closer look at what is reputed to be one of the four best places in the world to observe aquatic mammals like whales, dolphins and porpoises. In the capable hands of the Foundation for Information and Research on Marine Mammals, otherwise known as Firmm, we set out from Tarifa's harbour up the Straits towards the Atlantic. With the amount of cargo ships plying the Straits, I wasn't that optimistic of any sightings but about half an hour into our trip, the biologist on board called out “Long-finned pilot whales at nine o'clock”. We all rushed to the side of the boat and their sickle-shaped pectoral fins and bulbous heads could just be seen above the waves before plunging below the surface. Despite their name, these sea mammals are actually a large species of dolphin but they do have the distinction of having more neocortical neurons than any other mammal, including humans. Perhaps that's why they didn't stick around for long. 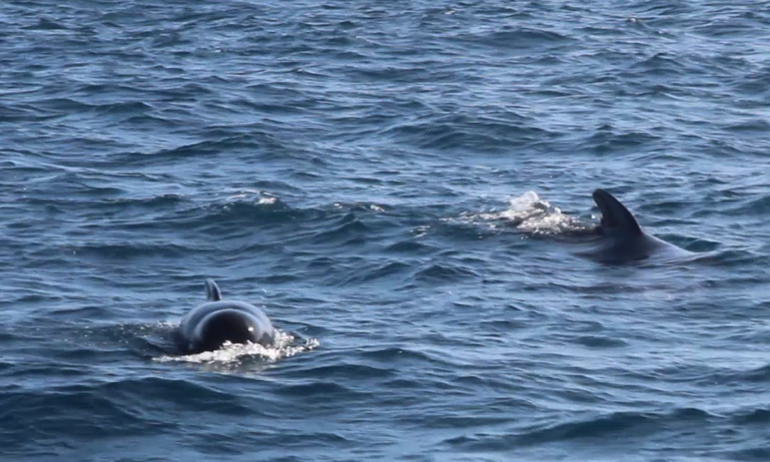 Then further along, we came upon a shoal of striped dolphins. With their characteristic blue and white stripes, these sociable sea mammals followed us for a while, appearing and reappearing on both sides of the boat. And the same happened with another shoal of common dolphins on our return. Our three-day trip around this windswept region with its rich flora and fauna, spectacular marine life and intercontinental flux of migrating birdlife was almost over. But we had one place left to visit, which was to put our impression of free-flowing nature into a more sombre human perspective. Manuel had obtained special permission from the Spanish Civil Guard for us to visit the Island of Tarifa. Once a sea fortress and army barracks, this rocky promontory of just 23 hectares is now something of a sanctuary for seabirds. We arrived in the early morning of our last day, along a causeway that now links the island to the mainland. 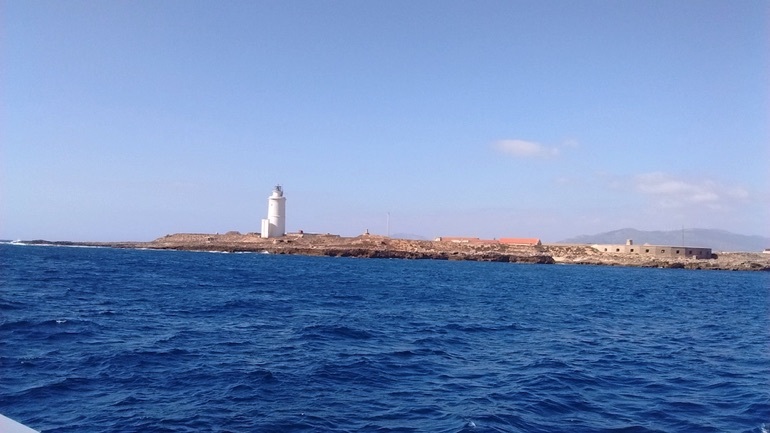 From a small observatory under the island's old lighthouse we spotted Balearic, Cory's and Scopoli's shearwaters as well as gannets skating carelessly across the waves. Back on land, a flock of yellow-legged gulls had camped out on the roofs of the island´s disused military barracks while another gull stood watch on the fortress battlements between two young cormorants. Yet hidden from view, lies a less idyllic reality. Since 1985, the Island of Tarifa has also been used as a migrant deportation centre. In a compound somewhere behind the old barracks, up to 90 mostly young sub-Saharan men wait to see if they will be forcibly returned to their countries of origin. So we ended our trip contemplating the gulls, cormorants, seabirds and migratory diversity of this unique corner of the world, while at the same time reflecting on the sad inability of humans to match nature's migratory freedom. Read more about birdwatching in tarifa. In the distance, oil tankers and cargo ships plied their way through the Straits, making it difficult to imagine that this seaway was once considered the last frontier for the ancient navigators of the Mediterranean. An unknown world lay beyond the Pillars of Hercules; or as we know them now, the Rock of Gibraltar and Morocco's Jebel Musa. James Dyson is a British journalist and communications consultant based in Madrid. At Dysoncommunications.com, he publishes a blog on cultural and professional events, as well as communication tips and advice. His Spanish-language blog Teosiesta focuses on the similarities and differences between British and Spanish society and culture. The Foundation for Information and Research on Marine Mammals (Firmm) organises boat trips from Tarifa habour to observe the whales and dolphins in the Straits of Gibraltar. Trips last about two hours and are organised several times a day from April to October. More information can be found on their English website: http://www.firmm.org/en/.